About - ONYX'S GREAT ADVENTURE. 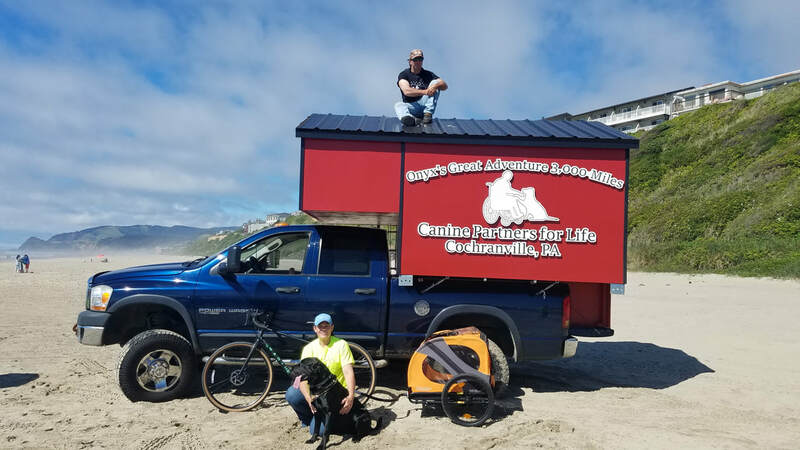 Onyx's Great Adventure aims to raise money and awareness for service dogs and those who rely on their assistance. It costs approximately $30,000 dollars and 3 years to acquire, train, feed, foster and prepare a service dog for their job of assisting their owners in their day to day lives. ​If this journey pays for just one service animal to be placed with a new owner then our goal has been met. We are challenging each state collectively, to donate $10,000 or more and for the next state to donate more than the previous state. Donate a $1, donate $30, spread the word, solicit donations. Click the donate now button to be redirected to Canine Partners for Life's donations page. If you wish to Volunteer- please send us an email to express your interest and location so we can coordinate volunteer opportunities with you. The custom dog house camper build took 8 months and lots of hands on from very dear friends of our Virgil and Sally Moon.